When my daughter was born six years ago, I carefully followed the car seat recommendations, used the infant car seat until she was 20 lbs, moved her to a convertible car seat when she was too heavy for her infant seat, made sure I waited until her first birthday to turn her convertible car seat forward facing, kept her in her convertible car seat until she was too big for her five point harness straps, then moved her into a high back booster seat at age 3. The current recommendations have changed! All children age 7 and under must ride in a federally approved car seat or booster seat, unless the child is 4’9″ or taller. Safety seats must be installed and used according to the manufacturer’s instructions. Infants (under 20 pounds and one year of age) must be in a rear-facing safety seat. Applies to both residents and non-residents of Minnesota. American Academy of Pediatrics (AAP) now recommends keeping children rear-facing until 2 years old if possible. Legally you need to keep them rear facing until age 1 and 20 lbs. Protect their fragile neck and spine from accidents by keeping them rear facing as long as possible. Some car seats can accommodate rear facing children until age 4. Children should remain in a forward facing, harnessed car seat until they are 4 years old or as long as they can comfortably fit and are within the car seat manufacturers recommended height and weight allowances. Many 5 point harness car seats sold today accommodate children up to 65 pounds. Don’t move to the booster seat especially the backless booster seat until they are 40 lbs, and 4 years old. They will remain in a booster seat for a long time, until age 8. Children are not ready for a seat belt only until they can sit safely in the seat belt, with the lap belt across their thighs and the shoulder harness across their shoulder and chest, not across their neck. They are legally not ready until they are age 8 and 4 foot 9 inches in Minnesota! If your car seat is older than 6 years throw it away and buy a new one!! Your child’s life is worth it! I cringe when I see people using a car seat clearly made in the 80’s, the technology improves constantly to keep your children safe, please don’t use an outdated car seat. Keep your kids in the backseat! Children should remain in the backseat until age 13!! They are used to riding in the back of the car, they will have plenty of time to ride in the dangerous front seat when they learn to drive. This is an excellent visual for knowing which type of car seat to choose and the safest age ranges for each. I am proud to be cheap! I also love knowing that what I clean my kitchen with ingredients that I can eat. I clean with an antibacterial microfiber cloth and my cleaning mixture. If it is something that is extra sticky or dirty or left bacteria behind, I let the solution sit for a few minutes to kill the bacteria before I wipe it off. But vinegar stinks! It only stinks until it dries! It removes odors in the air like cooking odors and helps keep your house smelling clean without adding any fragrances or chemicals. You will never hesitate to set food on your counter because there are no harmful chemicals that will ruin your food. 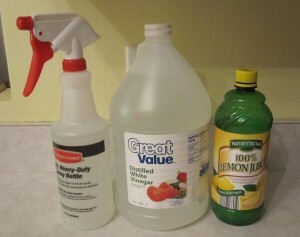 Vinegar kills 99% of bacteria naturally and lemon juice is also antibacterial. Here is what you need to make a few months of cleaner. -1 heavy-duty spray bottle. I bought a Rubbermaid bottle at Target in the laundry basket or iron aisle. -Bottle of White Distilled Vinegar, I buy the generic because I am cheap and I am only cleaning with it. -Bottled Lemon juice, again go ahead an buy generic, you are not eating it! Shake it up and start cleaning! I use my Vinegar spray cleaner in my living room and bathroom as well. I have been buying Seventh Generation dishwasher detergent for a couple of months and it gets my dishes clean but it is expensive. I spend about $5 on a box that maybe lasts me a couple of weeks. In the past I have researched home made dishwasher detergents, but everything I have read is that they don’t get your dishes clean or that they leave a film on your dishes, or that they make too many suds. I did not want to use anything that would be bad for my kids to breathe in while the dishwasher was running like bleach, so I kept buying store bought detergent. Yesterday I ran out of detergent and I forgot to pick some up at the store while I was out. It was nap time and I wanted to run the dishwasher but I could not leave the house to go pick up more. I decided I needed to figure out a green automatic dishwasher detergent recipe that would work from stuff I already had in my house, at least something I could use in a pinch. I found about 20 different recipes online but this one made the most sense to me. I made a batch, I have ran my dishwasher twice and the results are great! Sparkling clean dishes, clean smelling dishes, no harsh chemicals, environmentally safe products, no film, no residue and no suds spilling onto my floor! Two thumbs up! I thought about taking a photo of my clean dishes but I realized that my old, well used dishes would never look like the sparkling dishwasher advertisements, so I say you have to trust me, my dishes are just as clean as if washed with regular dishwasher detergent. Here is the recipe for homemade automatic dishwasher detergent! Mix the above four dry ingredients, store in a clean sealed container. Use 1-2 tablespoons of powder to each dishwasher load depending on how dirty the dishes are. I read that you can use as few as 2 kool aid packets with soft water, If you have hard water add more unsweetened lemonade flavor kool aid packets. I also filled my jet dry reservoir with white vinegar for the rinse cycle. This recipe makes 40 Tablespoons of dry dishwasher detergent, if you use 1 tablespoon per load that would be 40 loads. I guess the total cost of this was about $1.20. I am thrilled with the results of my cheap, home made, environmentally safe dishwasher detergent. I have been thinking about Internet safety a lot lately. I have a Facebook account and wonder if putting information on the web could put my family at risk. I don’t publish posts like I am at the lake, or I am in Omaha! I will instead post location information when I return like, I just got back from Omaha! I continue to respond to friends posts and comment on photos when I am away and make general status updates, but wait until I return to post pictures or post a comment where I was or what I did there. Posting from my phone could mean I am standing in my driveway, or that my son is using my computer right now, not a definite sign that I am not home. Not posting my location information immediately is way easier said than done. We spent 10 days on vacation this spring, I wanted so badly to post a picture of the awesome places we were visiting, and show everyone the view I woke up to each morning, but I controlled myself and waited until I returned. Now there is the phenomenon of Facebook Places and Foursquare, you are telling the world that you are not home, you are also telling people exactly where you are at that moment if they want to find you in public. What if you are somewhere alone with your children like at a park or walking out to a dark car and someone has it out for you. You are telling them that you have your home unoccupied and go ahead and break into my home when I am at the Twins Game for the next three hours. I am also vigilant about not posting my children’s real names on Facebook and especially vigilant about posting my children’s names and close up photos of my children on my momlifestyle.com site because that is public. I would never want someone who does not speak with me personally to know my children’s names. I only post nicknames because I don’t want a stranger to be able to call my children over to their car by their real names when I am not around. I also try to protect my children’s privacy rights by letting them introduce themselves to the cyber world when they are ready and old enough, not because it is convenient for me. I wonder about the safety of blog sites that show photographs and full names of their children. It does not seem very ethical to me to sell your children’s images and experiences for others to read, there are plenty of mom related sites that do make a profit from posting their children online. It would be incredibly easy for me to write daily articles if I told everyone stories of my children in addition to showing cute kid pics of my kids. If you notice most of my articles are about parenting topics that reference my experiences with my children but not specifically focused on my children and their information. I may be going over the top with millions of blogs and public information out there about peoples children but I would rather play it on the safe side. I am not going to stop blogging because I love being able to express my opinions on my web page and get feedback from others. But I will continue to keep my childrens names private and not tell people where we are on a moment by moment basis. I will continue to protect my children anyway possible including protecting their privacy on the Internet. I have always been a regular grocery store shopper buying my ground beef in bulk and using my vacuum sealer to save money. After watching the news about tainted beef, having to check lot numbers and worrying about the beef I already fed my family, then watching Food Inc. my priorities have changed. If you do not know the dangers of E. Coli Bacteria or have not watched Food Inc. you can find it on Youtube.com. Food Inc. opens your eyes and makes you think about the food you feed your family. Besides having my own garden each summer, I think it is important to buy locally where possible in order to support local businesses. We live in The south side of the Twin Cities and there are many farms and ranches and farmers markets that make it possible to buy locally. I decided to try to buy a half a cow for my families beef. The search started to find a local, organic, free range cow to buy. The research started around April every local, online ranch being on average $5-8 dollars per pound of beef for certified organic beef. Most were already sold out for the season and they were already taking reservations and deposits for the 2011 season. I remembered that a woman I graduated with from high school and reconnected with on Facebook, mentioned the previous year that she sold cows from her farm, so I contacted her and asked for details. My High School friends Ranch is located in Afton Minnesota, about 30 minutes south of my house. She had photos of her happy, healthy, young cows on her Facebook page. The cows had plenty of room to roam in grass, they were grass fed on no pesticide grasses, and were hormone free. These are the main important points of why I wanted to buy organic, but her cows also did not have the added cost of the organic certification process. She also had cows available to buy this year! I put in my order for a 1/2 a cow, we have a big freezer in the basement and I agreed to split 1/4 of the cow with 3 other friends. The average for 1/4 of a cow is $400 and 1/2 a cow is $800 depending on weight. She messaged me and said that they were bringing the cows in and to expect a call directly from the butcher shop in about 10-14 days. The butcher shop called me 12 days later and I gave them cutting instructions, how I wanted it packaged, (1 lb ground beef packs, 3/4 inch steaks, 2 steaks per package mostly boneless roasts averaging 2-3 lbs per roast.) I explained that I had never done this before to the woman on the phone and she was patient with me describing all of the options and what was common. They butcher shop called me the next morning and told me I could to come pick my beef up. 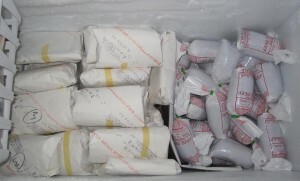 It was packaged in four large boxes two boxes with ground beef and two boxes with steaks and roasts and already frozen. It was aged/hung for 10 days for flavor after slaughter. I got about 120 lbs of steaks and roasts and 100 lbs of ground beef. Each package of butcher freezer papered meat is clearly labeled with my name to make sure I am getting my cow and the type and quantity of cut. You may be able to get your choice of cuts less expensive if you get every sale at the grocery store but you have no idea where your meat is coming from. I did not think that $3.37 per pound was too bad considering what you get when you average the cost per cut. I ended up keeping a full 1/4 of cow split every other cut plus an additional 1/8 (after splitting 1/4 of the cow with 3 friends) of this cow for my family. I believe I kept 3/8 of a cow. Here is the breakdown of my cuts. I had no idea what to expect since this was my first half of cow purchased, so I wanted to share my experience with others. I am truly pleased with my purchase, the hardest part was cutting a check for $740 bucks. The aged beef is very meaty tasting, it tastes like eating a steakhouse steak each time we eat it. The beef adds much more flavor to your food than quickly processed grocery store beef. When you brown the ground beef there is no need to drain the fat, it is about 95% lean ground beef and there is no lack of flavor with the reduced fat. If you could buy 95% lean ground beef what would that cost per pound? The steaks are marbled and fabulous. I have made two roasts and they are flavorful without the 2 inch coating of fat at the top of my slow cooker. 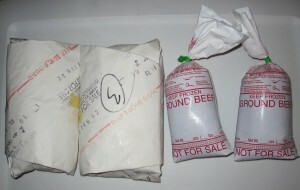 Consider buying a local side of beef, know where your meat comes from, and taste the difference!